Armagh boss Kieran McGeeney “has a real focus on humility and respect,” says Jamie Clarke. Clarke was speaking at the launch of the GPA's Fair Play Campaign on Thursday. ARMAGH’S JAMIE CLARKE believes that ‘sledging’ has become a deliberate strategy in certain counties’ playbook. But the nasty trash talk would not be tolerated in Kieran McGeeney’s dressing room, he said. 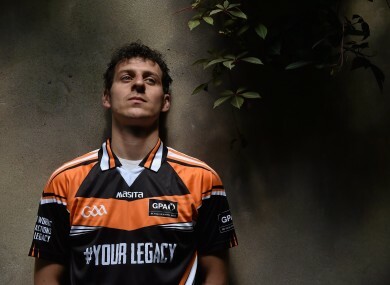 The Crossmaglen forward was speaking at the launch of the Fair Play Campaign, a GPA initiative to cut down on verbal abuse between players as well as other cynical elements that are creeping into Gaelic games. Over half of the Association’s members have experienced on-field abuse, and Clarke feels that certain teams are sent out with the instruction to get under their opponents’ skin. “Absolutely, and teams themselves will have done their homework,” he said. I would say more so in Ulster, although from an Armagh perspective, there are times when you are playing southern teams and you stupidly have got sectarian abuse, even though it doesn’t make sense when you are playing Gaelic football. 81% of players surveyed by the GPA believed that managers turn a blind eye to verbal abuse. Clarke has been in dressing rooms where certain opponents’ fiery personalities have been flagged up as a point of weakness before games. But there is a line that he is not willing to cross, and that attitude is reinforced by Armagh boss McGeeney. I think people paint the wrong picture of Kieran. His main focus is better players make better people, and he has a real focus on humility and respect. “He wants us to play fairly and hard – but again, he’s not a big advocate of saying (much). When he was playing himself, he didn’t say much. He just focused on the game. “If it ever does happen in a changing room… of course, I have been told different things about different players that might affect them. Email “'I have my own problems to worry about': Armagh star draws the line at sledging”. Feedback on “'I have my own problems to worry about': Armagh star draws the line at sledging”.